Rural Revolution: This will make you smile! Reader Terry in Florida, in response to my 25 Pieces of Trivia, posted a link to a YouTube clip called Jazz for Cows. It's nothing earth-shattering -- but it will absolutely make you smile! I am laughing for joy! 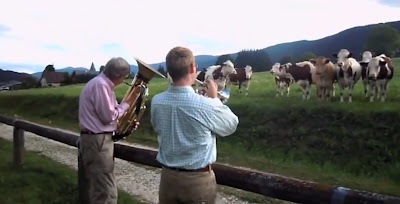 I love both Jazz and cows - what a fun clip. Make me smile? No, it made me laugh out loud! VERY funny! Crazy cows. Their little pea brains must have wondered, "What in the world...?" I'm pretty sure the cows are smiling, too! Hilarious. Thanks for posting it. Years ago, I had a tire blow out and I went off the road. No worries - I wasn't hurt. But while I walked around the grounded car trying to figure out what to do, I didn't notice the crowd of cows accumulating right behind me. I was in their field! When I turned around and saw them all lined up just like they were in this video, I couldn't help laughing out loud. That just made them "curiousier" and they started pushing each other aside to get a look at the stranded human. Funny! Thanks for the laugh. Jazz is ok, but I prefer Tchaicowsky, hah I kill me!! !